A reunion is a time for reminiscing and reflection on the past. It is also an opportunity to meet old friends and share experiences. Last night I attended my fortieth high school reunion and did some of the above. The overall result was a good time for most, if not all, and certainly for me. Meeting friends unseen for a decade or more was wonderful and renewing current friendships in person was even better. The most moving moment of the evening for me was when I reviewed a table of memorabilia that the organizers had displayed. There, amongst some old pictures of our classmates was one who was not with us. She had died of cancer more than a decade ago and I was moved to tears as the memories of our childhood flooded into my mind. But this moment, while moving, was the only one like that of the evening. Most of the night was filled with laughter and fond memories. The stuff of which pleasant dreams are made. In this simple yet profound novella Heinrich Boll provides a brief portrait of the lives of some members of the Wehrmacht as they are in retreat near the end of World War II. Told episodically with a casual style the makes the horror of some of the episodes even more powerful. Bolls simple straightforward style is perfect as he tells of the horrific details. He draws extensively from autobiographical events during his time as a soldier in World War II. What characterizes all of Böll's war literature is the fact that there are no heroes; his protagonists are ordinary, downtrodden soldiers who lack control over their lives and whose deaths are usually presented as being completely pointless, often painful, and always ugly. In keeping with his condemnation of war, Böll's style is realistic; he saw the war not as an exciting adventure but as an illness "like typhoid." This is an unforgettable work as it portrays a perspective on the war that few if any non-Germans could imagine. An early work of Boll, this shows signs of the novelist who would go on to write many much more complex works. And Where Were You, Adam? by Heinrich Boll. Leila Vennewitz, transl. Northwestern University Press, 2000. While we cannot reasonably expect perfection in man we can hope for the habit of labour that yields the fruit of wisdom. While I have not read the E. L. Doctorow novel on which the musical is based, I went to a performance of Ragtime: The Musical yesterday evening. With a book by Terrence McNally (one of my favorite playwrights and Opera maven), music by Stephen Flaherty and lyrics by Lynn Ahrens, this Tony Award-winning show was a delight from beginning to end. The cast was excellent throughout and made up for any shortcomings (the words were sometimes difficult to understand) with their energy. I particularly enjoyed the performances of Jayson Brooks as Coalhouse Walker, Jr., Jeremy Trager as Harry Houdini, and Charissa Armon as Mother. Also a delight was Maggie Portman as Evelyn Nesbit, even as she hammed it up a bit. The story revolves around three families (white, black and immigrant). Their lives are intertwined and with them we meet some of the more famous people of the first two decades of the twentieth century. After a dose of tragedy the musical winds up with a message of hope for the future. With the background of wonderful ragtime melodies it could not be otherwise. From: Benet's Reader's Encyclopedia, Fourth Edition. Ed. Bruce Murphy. New York: HarperCollins Publishers. 1996. "This book, which first established Lewis's reputation as an important writer, is both a satire and an affectionate portrait of Gopher Prairie, a typical American town, undoubtedly suggested by Sauk Centre, Minnesota, where Lewis was born. The heroine, Carol Kennicott, chafes at the dullness and sterility of her existence as the wife of the local doctor, and she tries unsuccessfully to make the townspeople conscious of culture and refinement. For a time, she leaves to lead her own life but eventually returns to make a kind of peace with 'Main Street.' "
Main Street by Sinclair Lewis. 1961, New American Library, New York. Yesterday, during our biweekly perusal and discussion of Dostoevsky's The Brothers Karamazov, the discussion turned to the nature of, or rather the need for, religious faith. We were at the point in the book where Ivan narrates his story of The Grand Inquisitor and we dwelt upon this question in addition to the nature of freedom and other topics. But our discussion continually returned to the issue of faith versus reason. I was reminded of Kierkegaard's argument for a 'leap of faith' as a requirement for true belief. 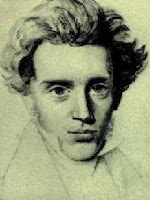 In Kierkegaard's Fear and Trembling he goes even farther describing faith as "the highest passion in man". 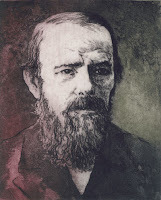 In Dostoevsky we see the contrast between the simple faith of Aloysha and the somewhat complex apparent unbelief of Ivan. This in spite of , or perhaps in addition to, their shared 'baseness' in the Karamazov blood. Regarding the need for faith, while I am impressed by the pervasiveness of belief throughout history I ultimately side with reason and science. This is not to say that we have all the answers to the ultimate questions, but that we are seekers and that the source of the answers will be found with the use of reason and science. That does not keep me from reading and discussing the works of Kierkegaard and Dostoevsky, but it does lead me to different answers to the questions which they raise. A Kierkegaard Anthology, Robert Bretall, ed. Princeton University Press, 1973. The Brothers Karamazov, Fyodor Dostoevsky. Ralph E. Matlaw, ed. W. W. Norton, 1976. I remember being mesmerized by Gustafsson's unique fictional world(s). This was my introduction to his work and it was an astounding discovery. The novel manages to narrate three disparate lives, all belonging to characters with the same name, done with a voice reminiscent of my favorite nineteenth century novels. The title is an obvious metaphorical reference to the game of chess, but the novel's complexity goes beyond that of mere characters moved about on a chessboard. It is truly indescribable and must be experienced, but it is a brilliant conception. Bernard Foy's Third Castling, Lars Gustafsson. Translated by Yvonne L. Sandstroem. 1988, New Directions, New York. T. E. Lawrence (Lawrence of Arabia) acted upon his dream 'with open eyes' and made it happen. In a book filled with deception he gives us a view into the world before the end of World War I changed everything. We see the various Arab factions and the deals made with the British. More importantly we are given insight into the men through Lawrence's eyes, his acute judgement, and his poetic narrative. He notes the keys to the Arab Revolt in the common language they shared and their heritage of the greatness that existed under the Caliphs going back to the six centuries following the death of Muhammad. We share in his pangs of conscience and his judgments of others and his own life and actions. He notes that "feeling and illusion were at war within me" and it reminds me of the birth of modernity with Faustian man. Also important are his comments on the British in the Middle East and the nature of the soldier in war. Ultimately I was moved and found support for my own subjunctive mood in this inspirational book. The Seven Pillars of Wisdom: A Triumph, T. E. Lawrence, Penguin Books, London. 1926. Victory Gardens has reached the end of the first month of their World Premiere presentation of Stuart Dybek's I Sailed with Magellan. This play, adapted for the stage by Claudia Allen, is a paean to the neighborhoods and local color found in Chicago. I enjoyed the episodic vignettes that were used to convey the story of young Perry and his family. The acting was superb, especially Lance Baker's portrayal of Uncle 'Lefty' and both Bubba Weiler and Justin Cholewa as, respectively, the young Perry and teenage Perry. (I am a bit of a fan of Lance Baker having enjoyed his past interpretations of Stoppard in Travesties and The Invention of Love at the Court Theater). While this play does not rise to the level of Stoppard it is satisfying in many respects in spite of the sometimes disjointed cuts between scenes and times. The attempt to evoke the dreams of young Perry was most effective in his relationship with his Uncle 'Lefty'. Less effective were the brief interludes of the teenage Perry exploring the world of young women. The underworld characters and their story, while understandably an important pert of the neighborhood color, did not mesh well with Perry's family story and the outlines of his coming-of-age story. Victory Gardens has produced an entertaining play about some aspects of mid-century neighborhood Chicago. In the summer of 1771, while he was living in a country home in England, Benjamin Franklin began an autobiography that he was destined to never finish. He prepared an outline of a final section that he did not complete, but the four parts that he did finish represent one of the seminal documents of the enlightenment. In his description of a "new Regime", as Professor Joseph Alulis, Basic Program Instructor referred to it in his lucid and invigorating presentation at the Chicago Cultural Center today (part of the First Friday series of lectures presented by The Basic Program of Liberal Education for Adults). Franklin described a new order or foundation for what became The United States of America. Only 5 years after writing the first part of his autobiography Franklin would join Thomas Jefferson and others in writing the Declaration of Independence of the United States. The autobiography is an inspirational work and one that recommends the life of virtue and wisdom. A book worth reading and rereading. T. E. Lawrence's masterpiece was published in 1926 even though he wrote most of it about 1919 following his return from the desert. My current reading of this classic account of Lawrence's exploits is both exhilarating and informative. The insights of Lawrence are numerous and I will comment further on these as my reading continues, but I am struck by the depiction of Arab culture of the time and its seeming connection with past and present. The importance of tales told around the hearth as the heart of Arab culture seems to be similar to the culture encountered by Muhammad as he was growing up centuries earlier. Further, Lawrence's keen ability to describe his surroundings and bring the events, of which he was often the center, alive is shown in almost every chapter. Finally, the portraits of the Arab leaders from Abdulla and Auda to Feisel are fascinating in their detail and psychological insight. Lawrence, it seems, was born for this journey and fated to share it with us. Seven Pillars of Wisdom: A Triumph, T. E. Lawrence, Penguin Books, 1981.